Usually we conduct union meeting on the third Saturday of every month. But this time, since most of the companies had declared 18-08-2018 as working day, the meeting was delayed by a week and was conducted on 25-08-2018. 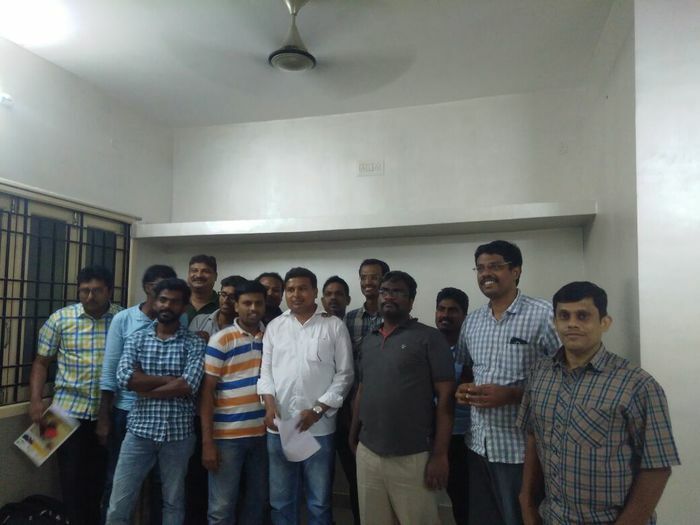 During the meeting, election of union office bearers was held as the main agenda. Proper announcements have been made for this elections in the union website as per the discussions held during the previous union meeting. It has been decided to conduct elections transparently after receiving nominations from union members. Before we go on with election details, am happy to share my association and past experiences with the union. Formerly, there was a general perception that IT employees are not covered under Labor laws. As a result, IT employees suffered a lot, being helpless and voiceless individuals against mass retrenchments, prolonged working hours etc. After continuous campaign among IT employees, NDLF –IT Employees Wing was formed in 2015 under the leadership of Mr. Karpaga Vinayagam. Union has voiced out and taken legal steps to fight against the oppression on IT employees. Union had also fought legally to put an end to the above doubts about applicability of labour laws to IT sector. NDLF established that As employees working in IT are also workers who get salary like any other worker in the industrial and factory sector; and as they are not involved in any profit making decisions, Industrial Disputes Act 1947 would apply to IT employees. This legal victory about the right to have Union was a historical event in Indian IT industry. This victory helped to end the fears and voicelessness of the struggles of IT employees and paved way for finding solutions for IT employee problems through organized open struggles and negotiation with the companies. Union have also been exposing how IT organizations are into illegal activities like mass retrenchments via forced resignations, forcing extended working hours in order to make profit and to enrich the shareholders; and how government is careless on this issue. In June 2017, union office bearers were elected from among the members and under their proactive initiatives, the union has been addressing the issues faced by IT employees and also raising voice against social issues since then. To specify some of the struggles, union fought legally against compulsory 10 hours working time in CTS, forced resignations in Tech Mahindra, appraisal issues and PF claim problems in TCS. Union has also raised its voice against forced resignations in Verizon. We organized employees affected by forced resignations in Wipro and filed a caseunder Industrial Disputes Act 1947, section 2(K). We stood firmly for the employees rights under the guidance of NDLF State Treasurer and IT Wing Honorary President Vijayakumar. As a result, received failure notice in the case, which is the first 2K failure notice against an IT firm in India. This fight shifts to the labour cour now. We have also helped the affected employees from various companies by helping them file case under section 2(A). We also help them to take up the case in labour court after getting failure notice, in some cases employees received compensation from the company. Additionally, union has taken efforts to overcome the belief that the IT employees are isolated from the society. The union associated itself in the public/social issues and there by contributing back to the society. We have raised our voice against NEET Exam – which made medical education inaccessible for students who are economically poor and favors students from elite background, protested against farmers suicides, stood for farmers on Cauvery issue, showed solidarity with Sterlite protests and supported people struggle against other companies which violate Environmental Protection Act, 1986 and kill nature for their own profit. All these could not have been done by individuals. Seamless efforts and team work of Union office bearers and other union members made these practically possible. I would like to express my gratitude to all the contributors who have been helping the union to function successfully and also by associating the union with public issues even with shortage of funds and lack of people for field work. We expect to continue the same level of spirit in the upcoming years. In order to give opportunity to the new members in the union, elections were held for office bearer posts and executive committee members. I thank all the participants on behalf of the union. The details of elected office bearers and executive committee members of the union are as follows. On behalf of union, I congratulate the new office bearers and wishing all the members to work together and give their best after having learnt the lessons of the past. IT Friends – Take up Cudgels against Forced Resignations! Farmers Die, Yogi and Modi Practice Hate Politics! How Much it Costs to Approach Labour Department?- Zero!